Who doesn’t love the beach with the salty smell of the ocean, the feel of sand squishing between your toes, the shrill squawking of seagulls, and the endless, shimmery view? 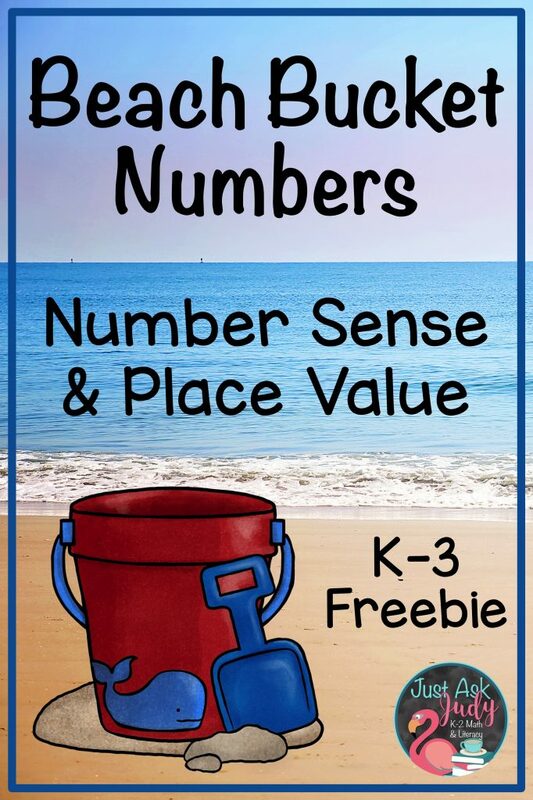 This summer, I have taken delight in creating several beach and ocean themed number sense and place value resources that have evoked many pleasant memories of time spent at the beach. 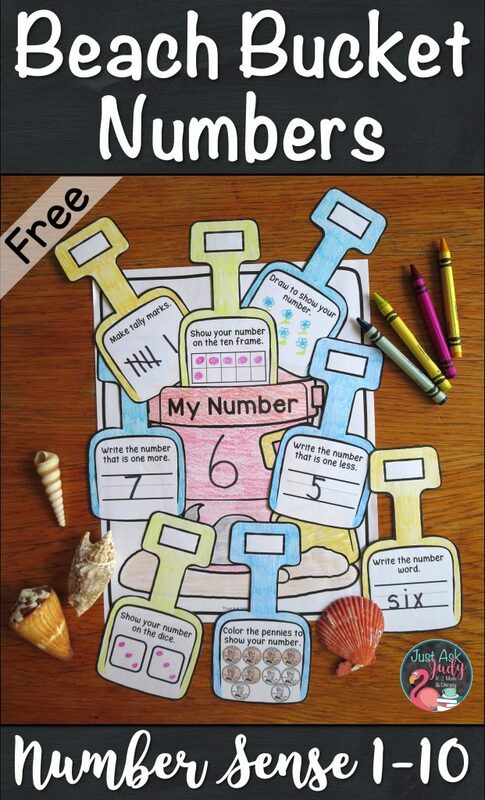 Use this free, versatile beach bucket and shovel activity to help maintain number skills that might otherwise be lost during the summer slump! It may be used with numbers 1-10, 11-20, 11-99, or 100-999. 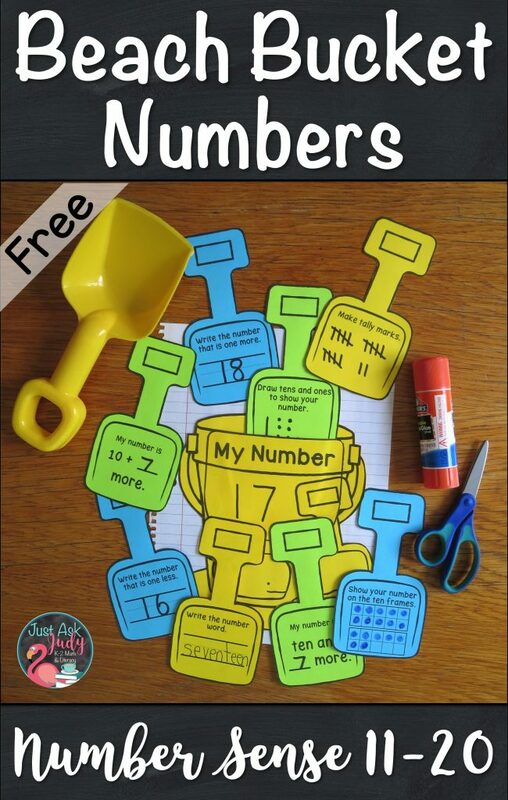 There are eight shovels integrating number sense and/ or place value skills for each range of numbers. This resource is perfect for reviewing and reinforcing number sense and place value skills with kindergarten, first, second, or third-grade learners at the end of the school year, during the summer, or at the beginning of school. Your students can complete this open-ended activity once or several times. 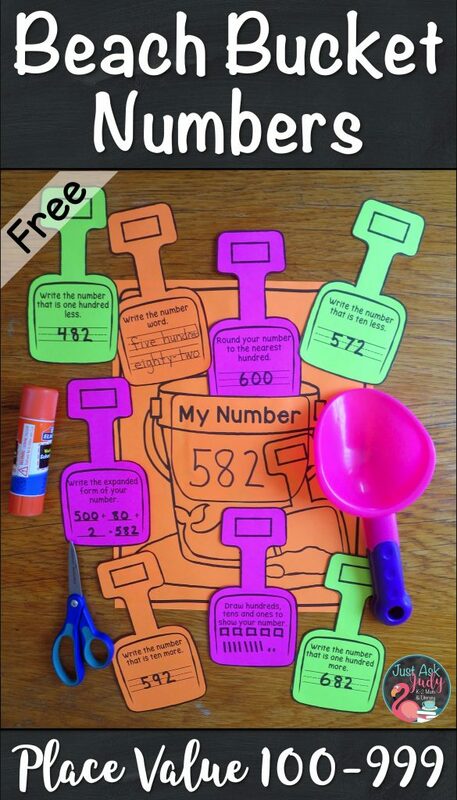 They may use this number skills activity in an interactive notebook (10.5 x 8) if the beach bucket is cut out. You can choose to print on white paper for your students to color or to print on colored paper. Simply print the four pages for the range of numbers you have chosen and collect the school supplies listed above. Print on white paper, if coloring the bucket and shovels, or print on colored paper. To get started, select a number for your students or allow them to choose within your chosen number range. Write this number on the My Number pocket or the shovel on the beach bucket page. Fill in the information for this number on each shovel. Color, if desired, and cut out the pieces. Your students can quickly draw hundreds, tens, and ones with squares, lines, and dots. They should glue the pocket on the beach bucket, being careful to only put glue between the dotted lines. The shovels will then fit inside the pocket. If your kids are completing this activity independently, you may want to make a sample with another number in your range and display the pages in order to assist with “reading” the directions on each shovel. Please note that there is a bit of coloring and cutting required for this number skills project. The shovels for numbers 1-10 include writing the number word, making tally marks, drawing dice patterns, filling in a ten frame, drawing the quantity, coloring pennies, and writing the numbers that are one more and one less. The number skills covered for 11-20 are writing the number word, making tally marks, filling in double ten frames, writing the numbers that are one more and one less, understanding ten and a quantity more, and drawing tens and ones. For the numbers 11-99, the skills are writing the number word, writing the numbers that are one more and one less, ten more and ten less, drawing tens and ones, writing the expanded form, and rounding the number to the nearest ten. Finally, the number skills covered for 100-999 are writing the number word, writing the numbers that are ten more and less, one hundred more and less, drawing hundreds, tens, and ones, writing the expanded form, and rounding the number to the nearest hundred. The awesome clip art I used for this resource was created by Digital Mojo. Check out these links for more summer math ideas! 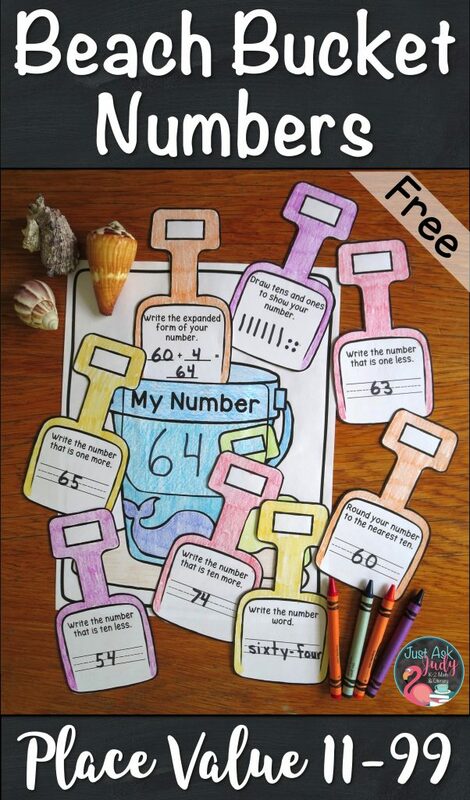 Click to see these ocean and beach themed number skill resources available in my TpT store.